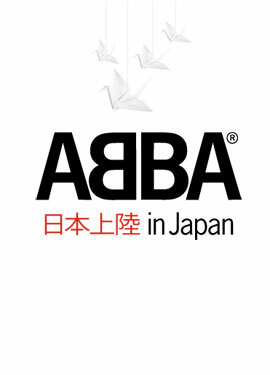 The upcoming ABBA In Japan DVD celebrates ABBA’s adventures in Japan in 1978 and 1980. The centrepiece of the release is “ABBA Special”, a television extravaganza filmed when the group visited Japan in November 1978. This legendary television special is now released on DVD for the first time. Moreover, it has been reassembled from the unedited material, which means that you will get more ABBA for your money! ‘Fernando’, which featured a couple of verses and a chorus in the original broadcast, is now seen in complete form for the first time. And the performance of ‘Summer Night City’, originally presented in a split-screen format with ABBA only taking up a quarter of the screen, is now focused entirely on ABBA. Finally, ‘The Name Of The Game’, which was edited out of the original broadcast, has been reinserted in its rightful place. Every song in the television special has been synchronised with the latest stereo remasters, except for the three live numbers: ‘Money, Money, Money’, ‘SOS’ and ‘Thank You For The Music’. The DVD comes with two bonus selections. The first is the fascinating fly-on-the-wall documentary ABBA In Japan Nov. 1978, which covers the group’s visit at the time of the television special. The disc also features the performance of ‘If It Wasn’t For The Nights’ from the special, but with the original, slightly different sound mix as featured in the broadcast – at the time, the song hadn’t been released on record yet and it was subject to further mixes by ABBA before finally being issued on the Voulez-Vous album. ABBA In Japan is also released in a 2-disc Limited Special Edition. The contents of the first disc are identical to the single-disc version. The second disc in the Limited Special Edition features a very rare behind-the-scenes documentary from ABBA’s concert tour of Japan in March 1980. The disc also features two galleries: one containing photos from the visit in 1978, and one offering a generous selection of Japanese single and album sleeves. Further goodies come in the shape of three ABBA photo cards and the original tour sticker from ABBA’s concert tour of Japan. Both versions of ABBA In Japan feature a fully illustrated booklet with an essay by Carl Magnus Palm detailing ABBA’s adventures in Japan and the making of the television special. The international release date for ABBA In Japan is October 26, 2009, although the date may of course vary a little from territory to territory. A frequent comment heard from ABBA fans is that so-and-so “owns” a song and no one else can do the song justice. It’s been used most recently in discussions about the recent CHESS In Concert CD and DVD releases (from last year’s Royal Albert Hall concert) and also tomorrow night’s Thank You For The Music: A Celebration of the Music of Abba concert in Hyde Park in London. But who really does own a song? And if a song “belongs” to a certain singer, does that mean it’s not that good a song but rather the performer or performance that makes it “good”? Because that’s the subtext every time someone says that no one else can perform a song. ‘The Winner Takes It All’ is a good example. Fans claim that it is “Agnetha’s song”, frequently vote it as the best ever ABBA song, and criticise every cover version, including the Benny-produced performance by Meryl Streep in the Mamma Mia!movie. Ergo, if every other version is not up to Agnetha’s, or is “rubbish”, then the song mustn’t be very good if it can’t be interpreted by anyone else. A similar thing has come up with the forthcoming Kristina concert at Carnegie Hall in New York. The claim is that Helen Sjöholm isKristina, no one else can perform the role and sing those songs. I saw the original Swedish production twice in 1999, with actress Frida Bergh in the role. I thought she played a fine performance, and her singing, especially of the signature song ‘Du måste finnas’, was up there with Helen’s performance that I was familiar with from the CD. The genuine sign of good music is that anyone can perform it in any style. Certainly there have been some awful cover versions of ABBA songs, but there have also been some excellent ones, the best of all interpreting the song in their own way. Music is an ephemeral thing. Once the song is over it doesn’t really exist. Music needs to be performed to stay alive. So who really owns an ABBA song? We all do, every time we hear one, whoever it’s performed by. One of the most anticipated and expected ABBA releases this year has been the Voulez-Vous Deluxe Edition. We have had precedent with the Waterloo 30th Anniversary Edition in 2004, which should have been in the Deluxe Edition series but wasn’t; Arrival Deluxe Edition in 2006 to commemorate the 30th anniversary of that album’s release; and ABBA – The Album Deluxe Edition in 2007. The Deluxe Editions don’t necessarily coincide with the anniversary of the albums’ release. It seems that this year we won’t be getting a Voulez-Vous Deluxe Edition, but that doesn’t mean we won’t get one at some point in the future, nor that we might not get Deluxe Editions of other ABBA albums. This year it appears that priorities have been elsewhere – the highly anticipated ABBA in Japan DVD for one. Many fans have written to Carl Magnus Palm asking whether there will be a Voulez-Vous Deluxe Edition or for news of the ABBA in Japan DVD or whatever other new releases might be in the pipeline. Unfortunately he’s constrained by what has been announced. As many of you would know I’ve been honoured enough to work with Carl Magnus on many ABBA releases over the years. I can assure you that he and Universal Music are well aware of what’s out there and what sort of releases the fans would like to see. Visit Carl Magnus Palm.com for much information on the work he has put in to so many ABBA releases so far and hints at other releases he would like to see in the future.